Zach Britton, who was traded to the New York Yankees last season from the Baltimore Orioles, will continue to wear the pinstripes after the lefty reliever and the club have agreed to a three-year contract worth $39 million. 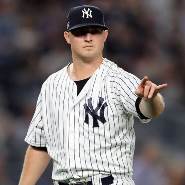 Britton, a two-time All-Star that features one of the best sinkers in the game, said via Twitter that he is very excited about being back with the Yankees. He’s been one of the most dominant relievers in baseball since 2014 will stay as a piece of the Yankee’s bullpen. He leads all qualified receivers in baseball with a 1.82 ERA, and a 77 percent ground ball rate in the past five seasons. His 1.86 ERA for the 2016-18 seasons was the lowest in major league baseball of all pitchers with 100 or more innings pitched. He had an especially amazing 2016 season where he posted an ERA of 0.54 in 67 innings of work as he notched 47 saves and a fourth-place finish in Cy Young voting. The 31-year-old had a strong 2018 season with the Yankees after being acquired from Baltimore before the trade deadline. In 25 games with the Bronx Bombers the left-handed pitcher held opponents to a .196 batting average and posted a 2.88 ERA along with 21 strikeouts, but once the calendar turned to September, he was especially effective. In 10 appearances in the final month of the season, Britton had an ERA of zero and opponents hit just 0.88 off him. After such a bright performance the club is hoping he can continue his ground ball dominance for years to come and help them get back to and win the World Series. After dealing with knee and forearm issues in 2017, Britton opted for surgery in the offseason and didn’t return to action until June 12.